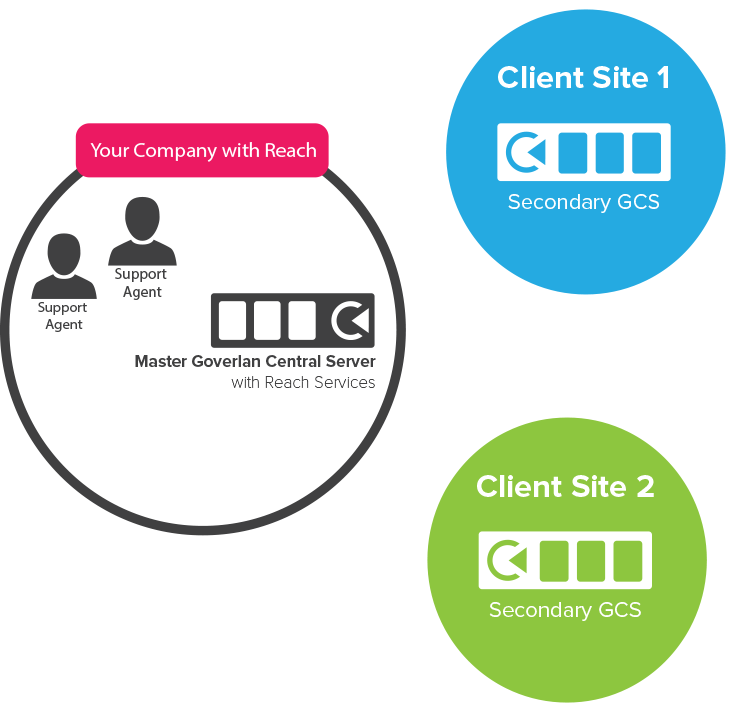 IT Service Providers can support entire client sites via Goverlan Reach Gateway Services. To do so, each client site must be equipped with a Secondary Goverlan Reach Server. Each Goverlan Reach Server requires a license. A GRS license can only be used to sign-in to a single GRS server. However, you can generate an unlimited number of GRS licenses free of charge. Login to my.goverlan.com, select the Goverlan Reach Server product under the Licenses section, then click on the Add License option. Specify a relevant name for your license and use this one to sign-in to the Secondary Goverlan Reach Server. The initial configuration of the Goverlan Reach Server at the client site uses the same procedures as described earlier in this user guide. However, you need to configure this server with a Secondary Relationship with the Primary GRS. Under the Relationship category of the GRS Settings, select This server depends on a Primary Goverlan Reach Server. Enter the public address of Reach Services exposed by the Primary Goverlan Reach Server. If this address is a FQDN that was configured with a TLS Certificate, then enable the option Certify Server Identity. This setting is the time interval between the synchronization cycle of the Primary GRS. This mainly defines how often the Secondary Server will contact the Primary Server for any setting updates and policy changes. Enter the name of the client site. This name is used during reporting of events and to categorize accessible computers from this site. Global Policies Assignment – All Global Policies for this site are provisioned via the Primary GRS. Site Access via Goverlan Reach Gateway Services – Grant remote management services of this site’s machines to the Primary GRS (ON by default). Site Audit Reporting – Forward all auditing events to the Primary GRS. Once the relationship between the Primary and Secondary GRS is configured, click this button to confirm proper connectivity with the Primary GRS. If the test fails, review the error message to make adjustments. 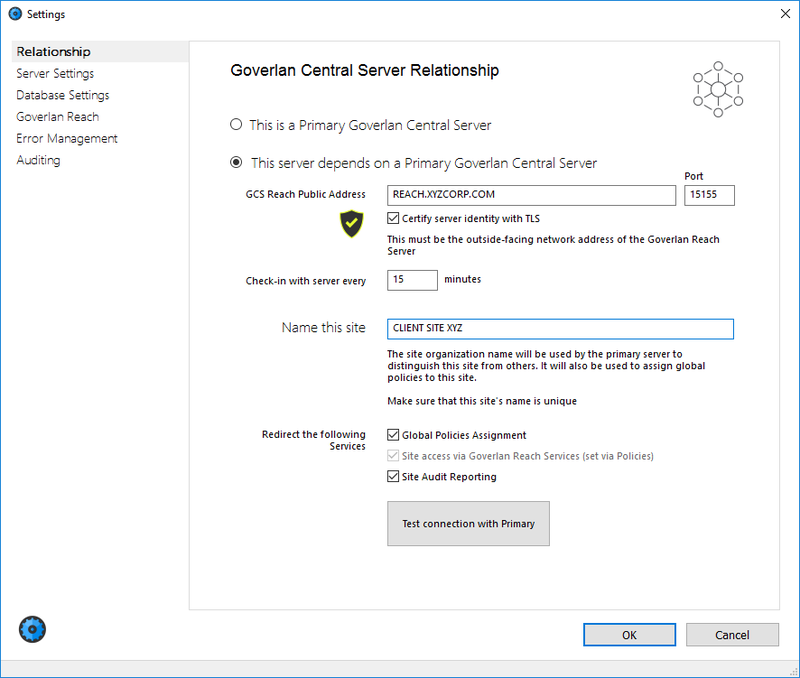 Once the relationship is configured, start the Goverlan Reach Server service via the Server Controls tab. That’s it! The client site can now be completely managed remotely from within the Primary Goverlan Reach network.